Thanks for visiting this page. 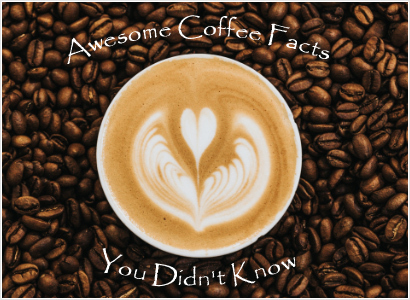 Below you will find many awesome coffee facts and fun coffee facts (over 30 facts) that you’ll enjoy. Did you know that coffee can improve your memory? Lighter roasted coffee contains more caffeine when compared to darker roasted coffee. If you take a 20-30 minute nap after drinking coffee you will feel new and fresh. Did you know that National Coffee Day in the US is on September 29th? Did you know that different restaurants put different amounts of caffeine in their coffee? This will vary from coffee shop to coffee shop as well. The most popular drink in the world is not coffee, it’s water. Coffee is second in line. Wow, can you believe that Kopi Luwak is considered the most expensive coffee in the world, reaching selling prices between $500-$600 per pound? Did you know that the second most traded commodity in the whole wide world, is? … yes, that’s right… COFFEE !!! Majority of coffee consumption 55%-65%, around the world, takes place around breakfast time. True Coffee Fact: Coffee triggers your metabolism. Another true fact is that coffee can indeed eliminate fatigue. Can will more than likely relieve your stress and improve your mood. Talk about a 2 for 1 special. Drowsy? Drink coffee. It’s true, coffee can eliminate drowsiness. Do you have a headache :T ? Drink coffee. That’s right, coffee is proven to soothe your pain and that includes your headache. True fact, coffee does indeed contain important oils. Coffee can give your body a boost, and sometimes we can all use a little boost. Speaking of being healthy, coffee can improve your health. Coffee can also give you a mental boost. According to research, coffee is mostly effective around 9AM to 12PM timeframe. Yikes, it’s true. Too much coffee can increase your blood pressure. Drink small amounts of coffee if you have high blood pressure. Boring coffee fact, but also true… If you drink coffee, that doesn’t mean you’re addicted to coffee. Coffee is considered a natural drug. Yes, in a good way. Coffee and cats? Yes, it’s proven. Take your kitty along for a drive-thru coffee run. Spending time with your cat while drinking coffee can put you in a good mood. How many coffee beans does it take to make 1 cup of coffee? The answer is 100 coffee beans … or 101 or 102… or 150 coffee beans for a strong cup of coffee. The higher the count, the stronger the coffee. It’s a boring fact, and a long wait time; however, it takes 5 years for a coffee tree to reach maturity before it can produce the first round of coffee beans. Did you know that when a coffee bean is roasted, it will increase in volume size, yet decrease in weight? 400 billion cups of coffee are being consumer every year. That’s a lot! This is very true… Over 90% of coffee shop customers feel that coffee drinks are overly priced. Over 80% of the population within the United States drink coffee. Facebook Coffee Fact … Over 20 million Facebook users mention Coffee as their interest. Arabian Wine? Yes, according to research, coffee in Europe (long long time ago) was first knows as Arabian Wine.